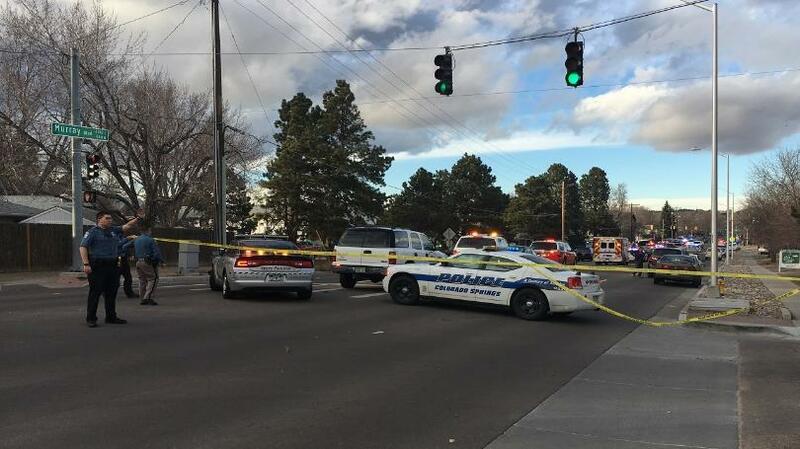 Police in Colorado Springs, Colorado, said they responded to a motor vehicle theft that resulted in one deputy being killed in the line of duty and four others wounded. Authorities responded to the scene in the area of N. Murray Boulevard and Galley Road. CBS affiliate KKTV posted images that showed police cruisers and ambulances at the crime scene. The Colorado Springs Police Department said earlier Monday they were "working a critical incident" and "all suspects were accounted for." The El Paso County Sheriff's Office said it also responded. El Paso County sheriff's Deputy Micah Flick, 34, has died after being shot in the line of duty, according to El Paso County Sheriff Bill Elder during a Monday evening press conference. Flick is survived by his wife and 7-year-old twins. Monday marked his 11th anniversary on the job. He was born Aug. 20, 1983. One woman whose husband worked with Deputy Flick remembered him fondly. "He always has a smile on his face. He has done so many things in this department in his 11 years. Today was his 11th anniversary," said Reni Dehaan. A procession for him started after 8 p.m. local time and which ended at the the El Paso County Coroner's Office, CBS Denver reports. "Deputy Flick was an outstanding member of my agency and he will be missed," Elder said. One boy, the same age of the deputy's daughters, watched the procession with his father. "It's sad when someone dies because they might have kids and stuff," Shane Neener told CBS Denver. "It's heart wrenching every time something like this happens ... And it's important for me that my kids know that these are important people in the community," Shane's dad, Mike, added. Colorado Springs Police Chief Pete Carey also said during the press conference that the officers were responding to a motor vehicle theft, encountered a suspect, struggled with him and then gun shots rang out around 4 p.m. local time. A civilian was injured and rushed to a local hospital. Two El Paso County Sheriff officers were struck and are hospitalized. A male suspect was pronounced dead at the scene. One Colorado Springs police officer was wounded and in surgery. His condition wasn't immediately known. Carey said it was a tough day for all law-enforcement agencies. "Tonight there is no distinction between our uniforms. State Patrol, sheriff's office and the Colorado Springs Police Department, our hearts are all broken," he said. The names of the other victims and suspect were not released. Colorado Gov. John Hickenlooper released a statement Monday to say the deadly violence against officers is having a grave impact on the state and that Flick's death was a "senseless act of violence." "We will once more come together to provide sympathy and strength for the deputy's loved ones and pray for the recovery of those injured," he wrote in the statement. "However, we also must come together and say enough is enough. We want each officer, every deputy, to know we are grateful for their service." Hickenlooper also urged Colorado residents to provide sympathy to Flick's family and to pray for the wounded. The Associated Press notes that Monday's shooting took place in a neighborhood of single-family homes, apartments and retail stores just east of downtown Colorado Springs, a city of about 465,000. Two other sheriff's deputies from the Denver area have been gunned down recently. Adams County sheriff's Deputy Heath Gumm, 31, died Jan. 24 after being shot while chasing a suspect, AP reports. Douglas County sheriff's Deputy Zackari Parrish, 29, was fatally shot in suburban Denver on New Year's Eve by a man with a history of mental health issues. Colorado Springs is about 70 miles (110 kilometers) south of Denver.